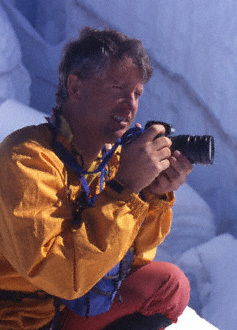 Carl Skoog is known globally for both his mountaineering accomplishments and his extensive body of work as a photographer. Though his photos have been featured in many ski magazines and advertisements, Carl’s photography seemed to be more about capturing the heart and soul of a place. In a recent interview with Powder magazine, Carl’s brother, Gordy Skoog said “For Carl, his photography was not so much a career, or even a way to make a living. It was all about being in the mountains." 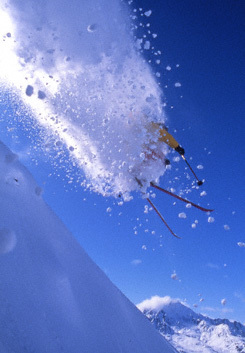 On October 17th, 2005, Carl was killed in a tragic accident while skiing Argentina's Cerro Mercedario. Beginning April 5th The Sam Day Gallery has the unique privilege of showing a collection of Carl's images, many of which were his personal favorites, having hung in his own home. Profits from sales at this show will be donated to "The Carl Skoog Foundation," a fund set up by the Skoog family to promote cooperation and equity between user groups in the backcountry. Opening reception will be April 5th, 6pm –8pm. First Thursday reception April 6th, 5pm – 8pm. The Sam Day Studio & Gallery is the working studio of artist and illustrator Sam Day, whose figurative oil paintings share space with the rotating exhibits in the gallery. His shows feature friends and artists by whose work he is moved. Open First Thursdays 5 - 8, Saturdays noon - 5, or by appointment. ©1994-2005 by Sam Day except where noted. Artists featured in the gallery retain their own copyright. Gallery pages built ©2005-2006 by Gina except where noted.